Avatars and pilots will be together together in Sentinel City. Nothing can possibly go wrong there – right? Did we mention that Matt Vancil will be there tonight? 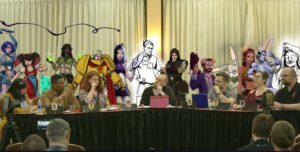 Join us tonight at 6PM PT for the latest episode of our original RPG livestream, MASTERS OF THE METAVERSE, exclusively on http://twitch.tv/zombieorpheus! The pilots are thrilled to see Thomas again, especially when he reveals that he has a plan to help them get back home: they simply need to find a way inside Sentinel City and travel to Joe’s Diner. But how can they get inside with the dome still in place? Thomas also reveals that the wasteland they are currently in is Earth 668, but 400 years in the future. Meanwhile, back inside Sentinel City, Bombshell regains consciousness in Dr. Migraine’s prison and manages to wake up Lady Veil. Together, they begin fighting Riptide and Dr. Migrain – while using an unconscious Butch as a blunt object. Inside the dream world, Hex and Butch find themselves up against Malpractice Inc., a group of old foes who are hell bent on their destruction. From the heavens, Dr. Migraine monologues about how Butch should have just been happy and stopped fighting. Fed up with this charade, Butch kills Code Red and proceeds to attack the rest of the group, while Hex destroys Candy Striper. Back in the real world, Bombshell and Lady Veil work together to summon Titan. Titan is more than happy to fight evil, once he has control of his own body. Shrugging off the various attempts at mind control, Titan punches Dr. Migraine into the wall, shattering the illusion world and waking everyone up, including Riptide. The group flees the prison and returns to Molly’s house where they learn some startling news: Dr. Migraine has been resetting time and everyone’s memories for over 400 years. Stunned, the group hurries to the home of Balthazar the Black in an effort to uncover the power source behind the dome. There, they find the decayed corpse of Titan, hooked up to various wires and computers. As Hex moves to unplug him, Blue Streak, under the control of Dr. Migraine, appears and warns her not to do anything. Dr. Migraine is cracking up, but he still believes he is doing the right thing. He requests that the group stands down and lets him reset again. They refuse and as Butch attempts to overcharge the computers holding Titan, Hex uses her magic to see into the past – revealing what really happened to Titan the day he died on Mount Rushmore. Back in the wastelands, the pilots have arrived outside of Sentinel City. Crash leaps off the airship in an attempt to punch the dome – which suddenly flickers and disappears. Emerging from inside the Sentinel City Bank, he rejoins the others as they enter Joe’s Diner. We have some amazing artwork inspired by this week’s episode from Orcrist, and some original fan fiction from Paxamo! If you feel inspired by the MASTERS OF THE METAVERSE (or any ZOE IP) to create any fan art, please share it with us on Twitter, Facebook, or Discord. We love receiving and sharing them!